﻿ Facebook “Save for Later” Feature » Red Mango Marketing! 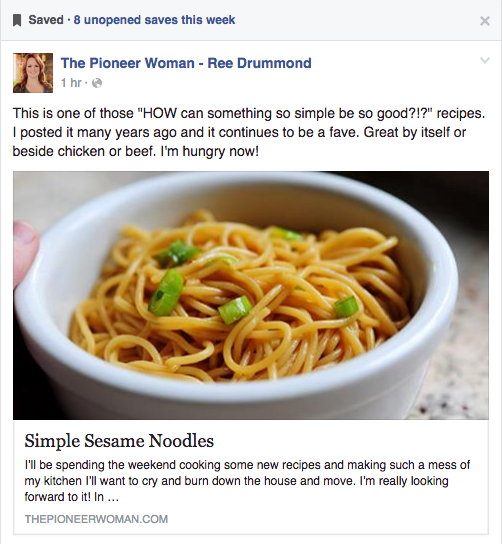 Do you know how to use Facebook’s “Save for Later” feature? With this tool, you can save and bookmark some of the things you see on Facebook to view later, like the links or videos your friend’s post, upcoming events, Pages or photos. This is a GREAT feature. I often find great recipes or Social Media Tips that I want to save and return to when I have time. The Save for Later feature lets me “save” it and return to it later – just like it says! 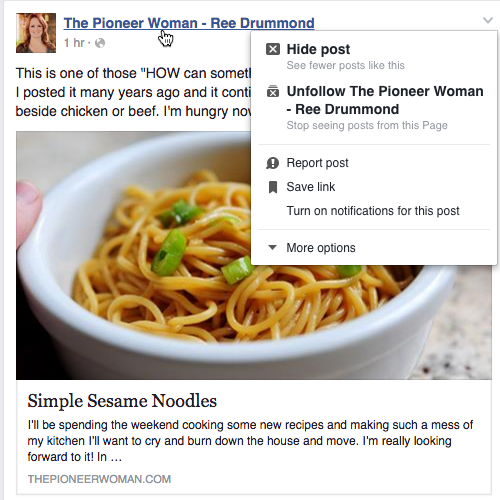 And, Facebook will occasionally post your saved content to your newsfeed as a reminder of what you saved that week. From your news feed, click the arrow in the right corner on an update you want to “save”. Below is an example. In my newsfeed, I want to keep this recipe from The Pioneer Woman. I just love her. LOVE her! Tried many of her recipes out on my family and college son, and they were a hit! Okay, back to our lesson. See the tiny arrow on the top right side of the post? Click it and it drops down into a menu as you see in the photo below. Look for the “Save Link” option in the drop-down menu, and click it. Done. How easy was that? Now, look at the post again. Do you see it? A “Saved” tag above the photo. In my case, it also shows me how many saved items I have this week and reminds me to check them out. So how do you access your saved content? You can go directly to www.facebook.com/saved or access your saved articles from your news feed on the left-hand side as shown below. And that’s it! Now you can start saving all the great content and…recipes. Let us know how they work out! This entry was posted on Wednesday, June 1st, 2016 at 5:48 pm	and is filed under News & Updates. You can follow any responses to this entry through the RSS 2.0 feed. Both comments and pings are currently closed.